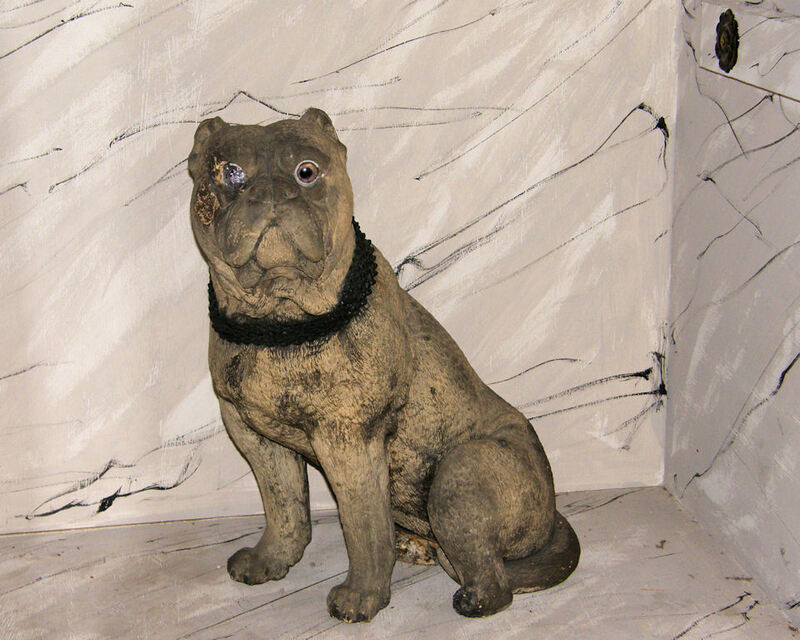 Home » Featured Articles » Stiffy Green – Phantom Bulldog? 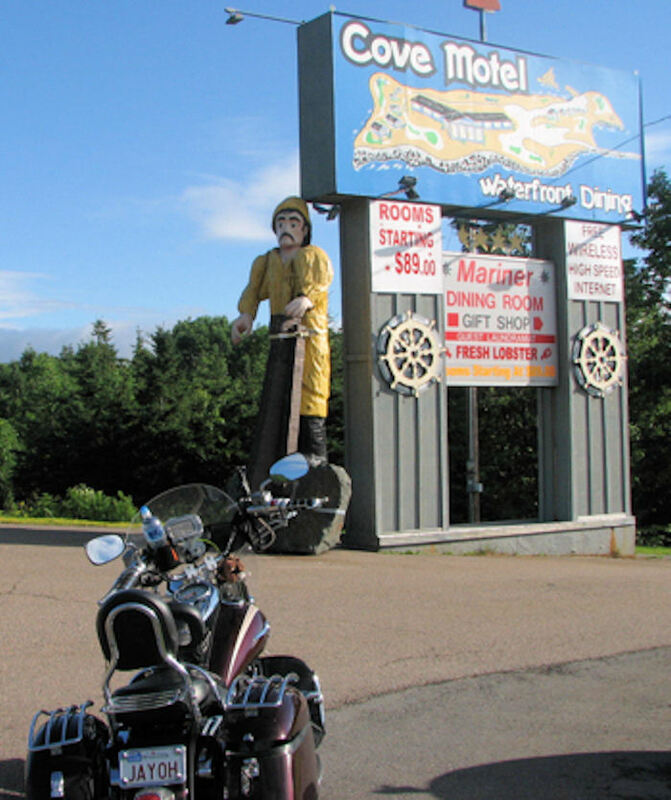 Bill is one of my favorite “roadsidewonder-ers” and I am distressingly behind in sharing some of his great roadside finds. Since Halloween is just around the corner, it’s the perfect time to share his visit with Stiffy Green – Terre Haute’s favorite green-eyed bulldog, and the subject of an enduring urban legend. Decades of Terre Haute residents have passed down the story of Stiffy – the loving pet of the John Heinl family. 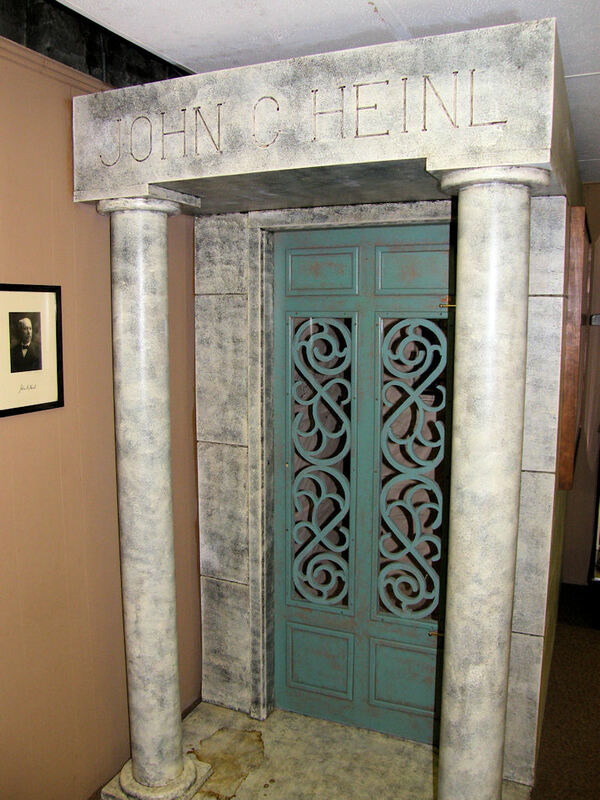 Folks say that after John Heinl’s death in the early 1920s, the dog restlessly continued to visit the family mausoleum at Highland Lawn Cemetery. 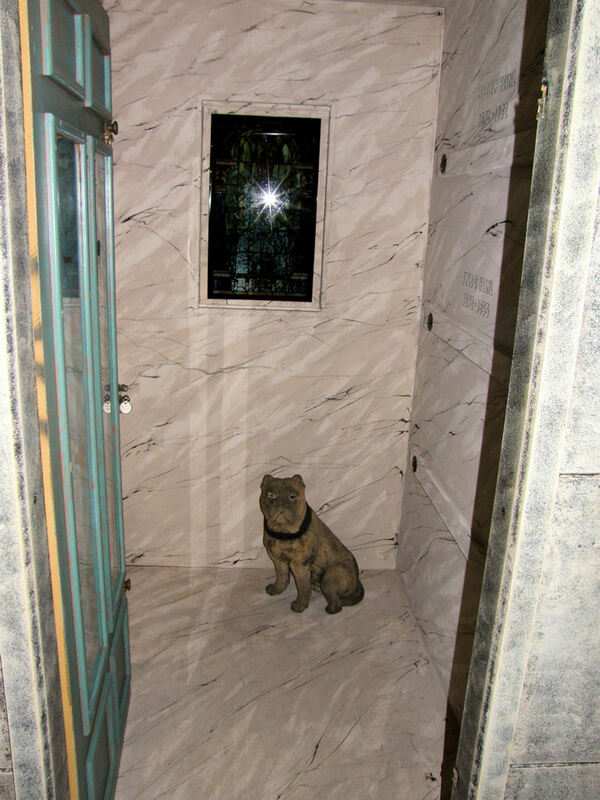 Stiffy eventually died on the steps of the mausoleum- forever grieving for his lost master. The tale spread that the surviving relatives had him stuffed and placed inside the tomb…where he guarded his master and glared out with cold, green eyes. Witnesses even claimed to see Mr. Heinl and Stiffy taking leisurely strolls through the neighborhood surrounding the cemetery. It became a Terre Haute tradition to visit the Highland Lawn Cemetery after dark, shine a flashlight into the tomb, and see Stiffy’s green glass eyes glowing in fierce warning to trespassers. At some point in the early 1980s, vandals fired bullets into the Heinl crypt and damaged part of Stiffy’s head and one of his eyes. Stiffy was removed from the tomb and now resides in a custom-built replica of the Heinl Mausoleum at the Vigo County Historical Museum. Be careful … Stiffy has a reputation for being a little cranky. After being shot in the eye, who wouldn’t? 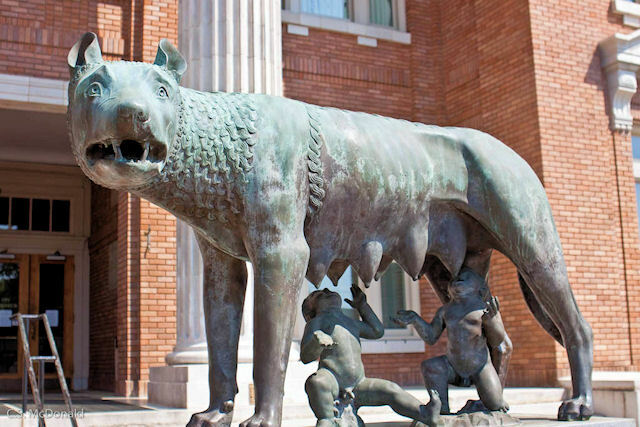 So, is Stiffy really a taxidermied canine, or simply a decorative statue of which John Heinl was particularly fond? You’ll have to travel to Terre Haute to find out. – Read Troy Taylor’s account of the legend of Stiffy Green here. – Highland Lawn Cemetery has a number of famous interments. Silent film star Valeska Suratt, famous union leader & Socialist Eugene V. Debs, female Congresswoman from the 1930s Virginia Ellis Jenckes, and Vaudeville strongman Louis Rudolph Yansky all share Highland has a final resting place. – It appears that the Vigo County Historical Museum’s website is down at the moment; I will post a link when the site if functional. Owney is a great one too. Wow, this was equally cool and creepy! Great post! I am the great granddaughter of Louis R. Yansky the Vaudeville strongman and a distant cousin of Debs. Your name looked familiar and then I figured out why … it was because I was on Findagrave.com after I posted this and I saw your entry! I saw Stiffy Green as a young girl when he lived in the cemetery with his master. It was an awesome sight to see indeed…..
Wow, can’t believe I missed this around Halloween. Mausoleums give me the willies. Never heard this creepy story before and I used to be a Hoosier. I remembered that you used to be a Hoosier …. South Bend, right? p.s. Like your new layout!